Year six spelling worksheets teach your child about suffixes, anagrams, and new vocabulary. Ten- and eleven-year-olds come into the year six knowing many common spelling rules. Fifth graders focus on spelling new vocabulary and manipulating words with contractions. These year six spelling worksheets will help your child improve his written vocabulary with ten-dollar words that are spelled correctly. Improve your kid's writing with year six spelling worksheets. 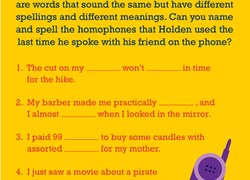 Help your budding wordsmiths develop their figurative language skills with this fun pun activity! This is a great worksheet for students to practise identifying and using homophones as they work to create their very own puns! This year six worksheet is all about homophones, or words that sound the same but mean different things. The words indicated on this worksheet may sound and look the same, but they are "homonyms," meaning that they have different meanings. Double trouble! Help your students understand figurative language as they practise identifying homonyms! Help your students use homonyms to write their own puns as they practise using figurative language with this fun activity! Students will get even better at creating punny sentences as they use homonyms! This is a hilarious worksheet for students to dive into as they hone their figurative language skills! Young wordsmiths will practise identifying the differences between homonyms and homophones as they analyze puns.